Already losing habitat thanks to Peapod, Whole Foods Delivery, AmazonFresh, and other delivery services, supermarket cashiers have been dealt another blow early in 2018. 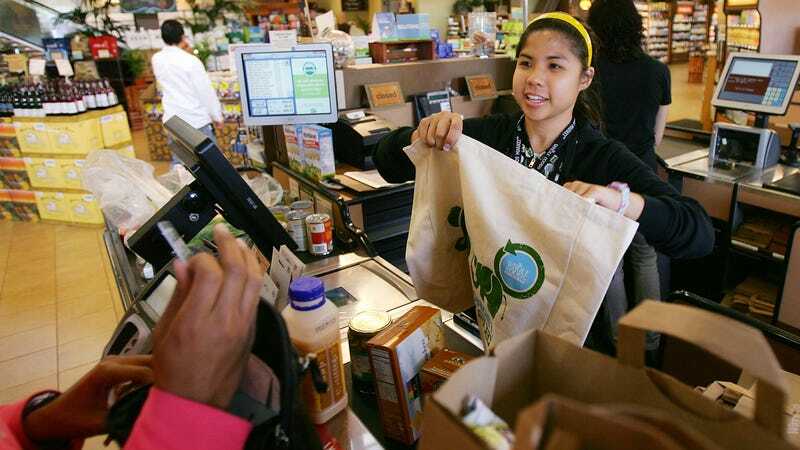 Digital Trends reports that grocery store chain Kroger announced it will expand its Scan, Bag, Go cashier-less checkout service to more than 400 stores this year following a successful pilot in 25 stores. Scan, Bag, Go ditches the cashier checkout in favor of an app that allows shoppers to scan bar codes as they shop, then present their phones at a kiosk and pay before leaving. Kroger also recently opened its 1,000th ClickList-enabled store, allowing for online grocery shopping and pickup. While this isn’t yet a fatal blow to grocery store cashiers, it does represent the latest tech encroachment that threatens their survival. Cashiers once enjoyed population distribution across the entire United States, in climates ranging from humid subtropical to midlatitude desert. As shoppers have switched to grocery delivery, online ordering, and self-checkout stations, the once-numerous cashier species now finds itself dwindling in number. Researchers warn that if such trends aren’t contained, cashiers could be upgraded to endangered status before the end of the decade.